Found 2 file extension associations related to Enterprise Architect and 2 file formats developed specifically for use with Enterprise Architect. 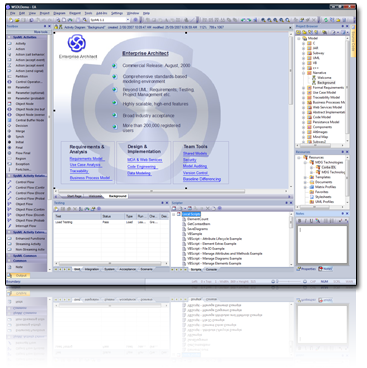 Developer: Sparx Systems Pty Ltd.
Enterprise Architect is a collaborative modeling, design and management platform based on UML 2.1 and related standards. Agile, intuitive and extensible with fully integrated, powerful domain specific high-end features at a fraction of the cost of many competitors. An enterprise wide solution for visualizing, analyzing, modeling, testing and maintaining a wide range of systems, software, processes and architectures. Team based, with a proven track record and close to 200,000 users worldwide; Enterprise Architect is the scalable, standards compliant toolset that is perfect for your next project. If you need more information please contact the developers of Enterprise Architect (Sparx Systems Pty Ltd.), or check out their product website.